Just a few of the basic textures that can be used in your landscapes. These textures work for any shape, and can also be used for ground cover. You can use a little or a lot of any texture as you wish. What counts when using these textures? Tightness, lightness, size and direction. The direction and/or curve of the texture lines will affect the 3Dness of an object. Don’t have much time, but want to get in some drawing? That’s an excellent time to practice! Just draw lines or scribbles on whatever paper is handy. Practice for one minute or 10. It can be therapeutic and while you don’t have a finished work you ARE learning and your next finished piece will be the better for it. Play with the number of lines, the direction, the length and the width. Get a feel for what you like and how you might use the differences. I’m only touching on the idea of depth or volume here. 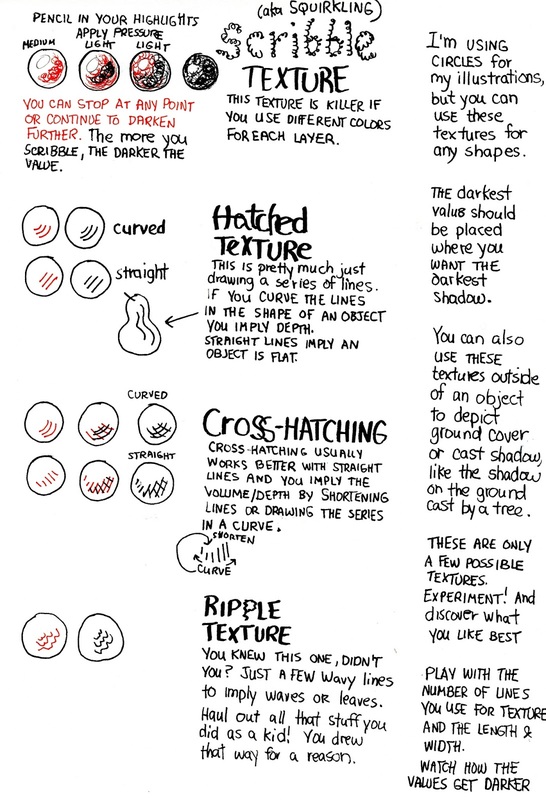 Textures can be used to help for that, and are also useful for shadows. But it depends where you are using them and on what, so I’m not going to discuss it in detail at this point. You can google and find some truly outstanding tutorials on this subject. My hope here is just to give you a quick reference that will take little time to look over and be easy to remember.